But now I’m rapidly going off Blu-ray, and leaning towards HD DVD. For two reasons. First, the other day I purchased four Blu-ray discs from Amazon. They were Chicago, The Prestige, Deja Vu and King Arthur. I figured that I’d be safe from region code issues because none of these were new movie releases. Damn, King Arthur was released way back in 2004! But when they arrive, I find that all but Chicago were Region A encoded, and thus unplayable on Australian Blu-ray players. From now on, I purchase from overseas only HD DVD, or Blu-ray from Warner Bros. Why the latter? Because WB releases on both Blu-ray and HD DVD. It seems that they don’t bother to apply region coding to Blu-ray, since the titles are on HD DVD as well. All four of the above titles are from Buena Vista. 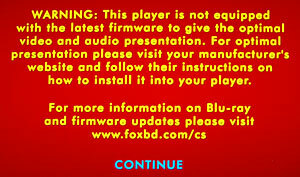 More information on Blu-ray region coding is here. – Enhances BD-Java behaviour of certain BD titles “The Die Hard”. – Enhances BD-Java behaviour of certain BD title “Pirates of the Caribbean At World’s End”. – Enhances BD-Java behaviour of certain BD title “Big Fish”. – Fixed the following two issues. 1) rarely won’t play a certain BD title “Robocop”. Incidentally, as far as I can work out the disc was fully supported by the Pioneer player once you’d gone past that message. This entry was posted in Blu-ray, Firmware, HD DVD, Region Coding. Bookmark the permalink.